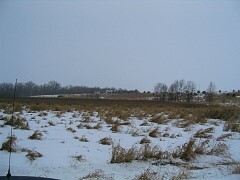 For the year 2005 the Minnesota pheasant hunting season was extended through the last day of the year. This has never happened during my lifetime. 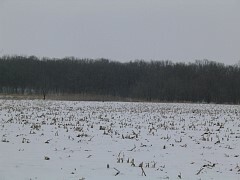 Now instead of ending around December 17 or so we late-season-loving hunters can continue to hunt. Last week Jim and I went out and saw 400 pheasants - that's right - 400! The amazing thing was that half the birds were roosters. 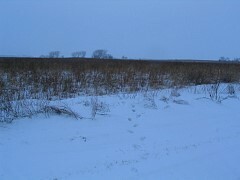 This means the hunting pressure was low, and if we have a mild winter the pheasant numbers could really take off. 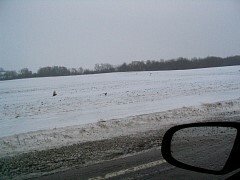 Here along the highway are some pheasants - I can't hunt until 9:00 a.m. and it's about 8:30 a.m. now. The forecast calls for heavy snow. I am gambling that where I will hunt will be on the edge of the storm and I won't be forced to quit hunting. 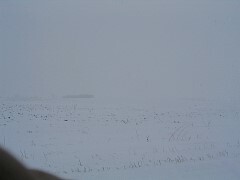 As I begin to hunt the snow hits and here you can see the near whiteout conditions. 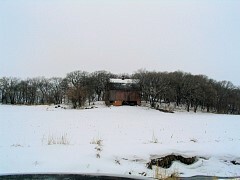 There is a barn in the distance, let's go check it out. Here are a couple of hens along the road. The birds were out feeding. 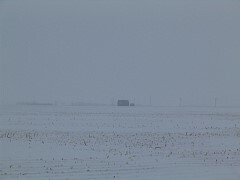 If the snow doesn't stop they are going to have to leave the wide open areas and seek shelter. 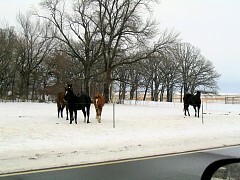 This picture is taken through my windshield. The windshield is tinted, so the color is off a bit. 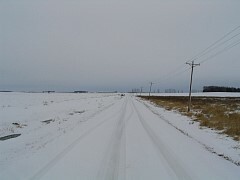 If the snow doesn't stop soon, I will get off the gravel roads, find a paved county road, then get to the interstate and go home. Check out the rooster running in this wintry landscape. The rightmost picture is an enlargement of the running rooster. You can always tell a rooster by the trademark white ring around it's neck. The snow has stopped. I spotted a few pheasants in the weeds on the left. I walked the area but they ran all the way to the back end of this cover and flew off. I have seen pheasants today but not any to shoot at. 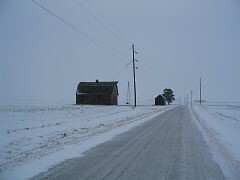 I like the countryside in the winter. Here are some passing scenes. Two jaunty roosters were walking alongside this creek - as I got out and loaded my gun they flew off. 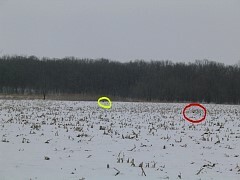 While driving by I noticed a turkey out feeding (yellow circle) but didn't see the rooster racing along (red circle) until he suddenly flew out of the field. 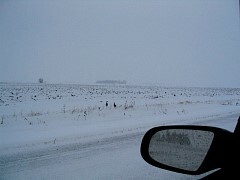 When you pass picked corn you can never tell how many birds you pass by who are out feeding. Enlargements from the pictures above of the turkey and the rooster. 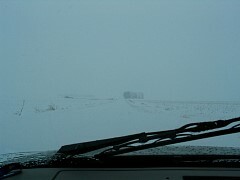 I had only seen about 50 pheasants to this point today. 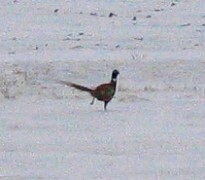 Now I began to see large numbers of pheasants. 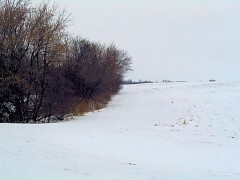 When I pulled up to this small slough I suddenly perceived group after group of dozens and dozens of feeding birds. When I stopped my car wave after wave of birds flew into this slough - there are over a hundred pheasants out in these cattails. Last attempt of the day. When I pulled up here a couple of roosters left the road and flew maybe 30 yards into this light cover. You can see my footsteps as I went after them. No luck. Still it was a great day.